When we kicked off our Spring Greening DIY Design Contest we didn’t expect our intrepid innovators to take the call literally! 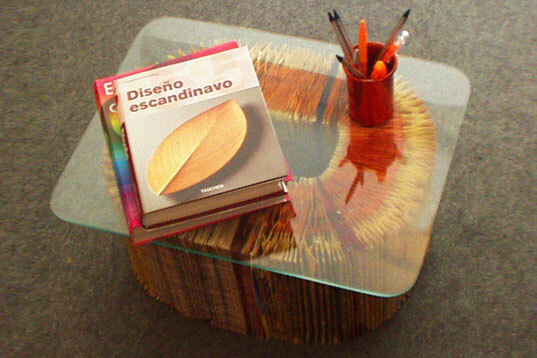 We’re thoroughly impressed that Rodrigo Jaroseski of Porto Alegre, Brazil did just that and fashioned a remarkable corrugated coffee table out of several old phone books. Everyone seems to have a couple of these outdated directories collecting dust somewhere – every year in the United States alone 500 million directories are printed, and the E.P.A. estimates that they account for nearly 5% of total landfill waste. By carefully folding and gluing together the pages of several phonebooks, Rodrigo created an inspired re-use for these antiquated tree-pulp products. If you’re a fan of this design, cast your vote below! I love the look of this table. However, with all the glue that would be necessary there's no way this is a very green project. I think this is clever and good looking. Valeu Rodrigo!!! Teu trabalho fala por si!! PARABÉNS!! olha aí o design brasileiro arrasando! When we kicked off our Spring Greening DIY Design Contest we didn't expect our intrepid innovators to take the call literally! We're thoroughly impressed that Rodrigo Jaroseski of Porto Alegre, Brazil did just that and fashioned a remarkable corrugated coffee table out of several old phone books. Everyone seems to have a couple of these outdated directories collecting dust somewhere - every year in the United States alone 500 million directories are printed, and the E.P.A. estimates that they account for nearly 5% of total landfill waste. By carefully folding and gluing together the pages of several phonebooks, Rodrigo created an inspired re-use for these antiquated tree-pulp products. If you're a fan of this design, cast your vote below!